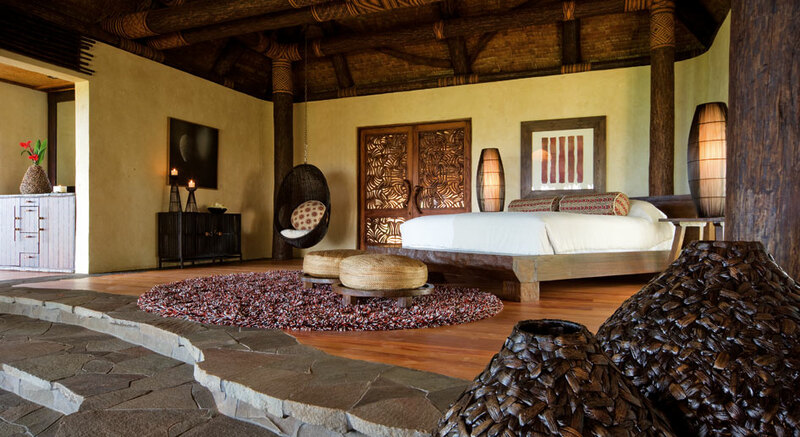 One’s first impression of Laucala Island is that it must be a dream. This 3,000-acre private isle — formerly owned by Malcolm Forbes — offers refuge to the privileged few in just 25 one-, two-, and three-bedroom residences. Sprinkled across the property and decorated in the most fashionable Fijian style, these thatched-roof accommodations welcome with private pools and indoor/outdoor showers. Amenities are extravagant — from five restaurants, a golf course and a hilltop spa to an equestrian center and glass-cube pool — while the staff is friendly and discreet. Let them create a private picnic for you on one of the isolated beaches. With a private beach, a unique panorama, built on stilts above the lagoon with its own island for swimming, on a private peninsula with a beach and landing place or up on the hill, each of the 25 luxury residences is a cathedral of good taste. With an unmistakable commitment to nature and an unequalled combination of space, Fijian traditions, specially designed interiors, luxurious comfort, and the fluid transition from indoor to outdoor living, they pave the way for undreamt – of South Seas flights of fantasy – undisturbed privacy, with genuine Laucala luxury always included. Laucala shows its most ethereal side in an iridescent kaleidoscope of sporting and cultural activities. Diving in a unique underwater world, rain forest tours, horseback riding, yachting, golfing on the 18-hole championship course, or meeting native artists – everything is possible on Laucala. But smaller guests are catered for as well. On Laucala the kids’ club with its demanding programme is just as much a matter of course as the five thousand square metre pool and premium spa. Living on Laucala just means “going with the flow”! Cuisine á la Laucala: Romantic candlelight dinners on the private beach, fine dining in the elegant Plantation House Restaurant, authentic special Asian delicacies in the Seagrass Restaurant, a spectacular Sundowner cocktail in the Rock Lounge, avant-garde finger food in the Pool Bar, or a barbecue in the Beach Bar that captures the tropical atmosphere. The broad variety of culinary rarities fulfils you every wish, as do the specially selected wines. The superbly stocked wine cellar and the wine lover’s treasure trove makes the connoisseur’s heart beat faster. Whether it’s that great Burgundy, that morning cup of coffee, a fragrant croissant or the formal dinner, only the best is good enough for cuisine á la Laucala. On Laucala your soul collects magic moments like sea shells: While you watch the sun disappearing beyond the horizon, while the silver moon scatters its rays over the sandy beach and Aquarius is playing with his diamonds, the wellness expert’s magic hands open up the energy centres of your body and your soul floats on cloud nine in the Spa Suites. And when you experience one of the specially designed, relaxing highlights based on the natural resources of this island with that special someone in your life, your dreams will have finally come true. A Remarkable Honeymoons Package will include a fresh flower lei greeting, bottled Fiji water and cool minted towels upon arrival, round trip resort transfers, accommodations, all meals and all house beverages.